Professor Lepek is currently Associate Professor of Chemical Engineering at The Cooper Union. He was most recently awarded a Fulbright fellowship to be the Fulbright Visiting Professor at the Technical University of Graz in Graz, Austria (2016). In addition, he also recently invited to be a Visiting Lecturer (Professor) at University College London in London, UK (2015). Professor Lepek joined the Department of Chemical Engineering at The Cooper Union in January 2009. Since then, he has developed new courses in Particle Technology and Pharmaceutical Engineering and, along with Professor Richard Stock, has made significant revisions to the Chemical Engineering Laboratory course sequence. Professor Lepek’s research interests include particle technology, fluidization and multiphase flow, pharmaceutical engineering, modeling of transport and biotransport phenomena, and engineering education. In 2015, he received the Ray W. Fahien Award from the Chemical Engineering Division of the American Society of Engineering Education for his teaching excellence and contributions to engineering pedagogy. In 2011, he received the Engineering Education Mentoring Grant from the same division to help further his work in developing innovations in engineering education and pedagogy. 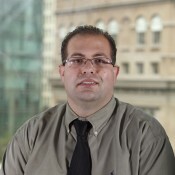 Professor Daniel Lepek received a Bachelor of Engineering degree in Chemical Engineering from The Cooper Union and received his Ph.D. degree in Chemical Engineering from New Jersey Institute of Technology (NJIT). During his studies at NJIT, Professor Lepek received an National Science Foundation IGERT (Integrative Graduate Education and Research Traineeship) Fellowship in Nano-Pharmaceutical Engineering, and an IREE (International Research and Education in Engineering) award. In addition, he received the NJIT Newark College of Engineering Outstanding Graduate Student Award as well as the Schering-Plough [now Merck] Science and Innovation Award. His research work was focused on enhancing the fluidization and flow properties of nanoparticles, including for future use in the pharmaceutical industry. This work was performed in conjunction with the University of Seville, where he worked as a research scientist, and resulted in three major publications in top chemical engineering journals, including the cover image in the AIChE Journal. Professor Lepek currently teaches the Chemical Engineering Laboratory sequence, undergraduate and graduate courses in Transport Phenomena, and graduate elective courses in Particle Technology and Pharmaceutical Engineering. He is an active member of the American Institute of Chemical Engineers (AIChE) and the American Society of Engineering Education (ASEE). He also serves as a Chemical Engineering Program Evaluator for ABET.